Four Cooper Union architecture students took home four of the 2013 Student Design Awards given by RSA United States, an organization affiliated with England's Royal Society of Arts, including a clean sweep of the architecture, industrial design and interiors category. Jeremy Jacinth, Natalie Savva, David Varon and Teddy Kofman all received prizes that included paid internships and monetary awards, for their submissions focused around "Transit Options for the Future City." Teddy Kofman and Jeremy Jacinth won architectural internships, Natalie Savva won the interiors internship and David Varon won the applied industrial design internship and a special prize for Sustainability. This was the first year that the RSA Student Design Awards were handed out to U.S. students, beginning a new tradition in America based on the RSA Awards in England that have been handed out for 88 years. The event, which included a keynote address and an awards ceremony, was hosted at Cooper’s Rose Auditorium. “The key to this is growing a new Design Awards program in the US that is focused on design for social change and innovation,” David Turnbull, a Professor in the School of Architecture and the Chair of the US edition of the RSA Student Design Awards, says. The RSA-US Awards website describes the awards as a, "program to inspire collaborative, multidisciplinary design-led social change which connects design students and faculty with industry needs." Professor Turnbull helped bring the progressive and sustainability-oriented design competition to Cooper Union, home of the Institute for Sustainable Design and 41 Cooper Square, a LEED platinum-certified green building. Teddy Kofman, who won three awards, submitted a portion of his final year thesis work aimed at the problem of the urban expansion of Houston, Texas, and the resultant loss of necessary prairie and forest land. “As the city grows it threatens the forest and prairie, and is consequently prone to more frequent flooding and higher levels of air pollution,” Kofman says. “Urban expansion leads to deteriorated living conditions for residents. 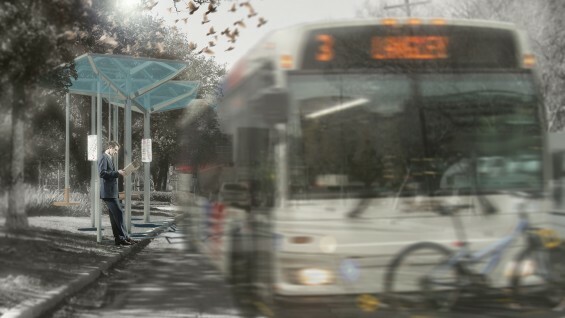 My focus is to propose an urban strategy as well as a small-scale design that could be implemented throughout the city.” Kofman’s winning proposal features a transit station that harvests dew and rainwater and uses it to irrigate surrounding patches of trees, as well as providing a habitat for urban wildlife. Together the shelters would offset the impact of expansion by creating and supporting a biological connection between proposed “Islands” of urban forest and prairie. Diagram from Jeremy Jacinth's "A New Delta Ecology"
Jeremy Jacinth’s winning entry “A New Delta Ecology,” based on his thesis work, examines the Sacramento - San Joaquin Delta in Northern California, a former marshland drained in the 1850s and converted to farmland islands through the construction of levees around the islands' perimeter. For various reasons the land has since compacted to more than twenty feet below sea level; this has placed extreme strain on the levees which has resulted in 166 instances where islands have flooded due to failure since 1900. Jacinth proposes allowing the islands to be inundated with water, using some as floodplains and others as reservoirs, while implementing new technological approaches to agriculture that would be better suited for this dynamic environment. "Winning the transit options category is an extremely gratifying experience," Jeremy Jacinth says, "It has not only awarded me with a job and money, but with a sense of pride and confidence for the work I have done here supported by the mentorship of the engaged faculty of The Irwin S. Chanin School of Architecture at The Cooper Union."